We have been traveling for the past month, and it’s hard to pull away to write while surrounded by family we only get to see a few times a year. Thus, I have some catching up to do! 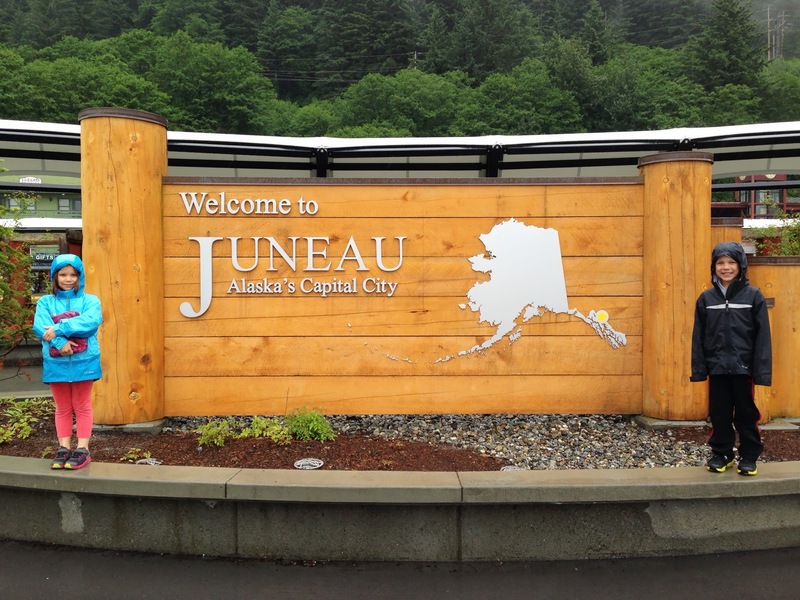 This year we passed through Juneau on our way to the Lower 48. 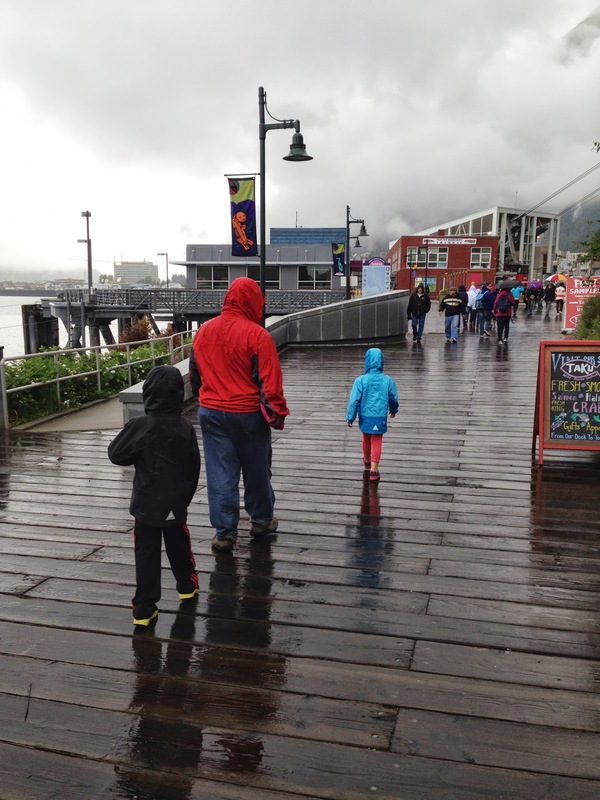 It’s been a spectacular summer in Alaska, even in Southeast, but somehow we hit it on a more typical, rainy day. Perhaps the only one of the summer? Ah well, we were there and made the best of it. 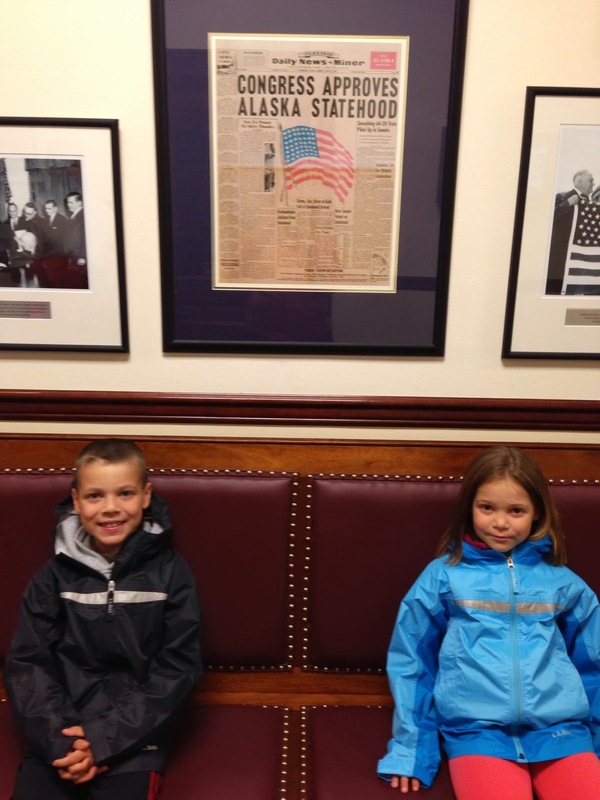 Our first stop was the Alaska State Capitol building. There was some major construction in front of the building and the entire street was closed, but we were able to enter through a side entrance. 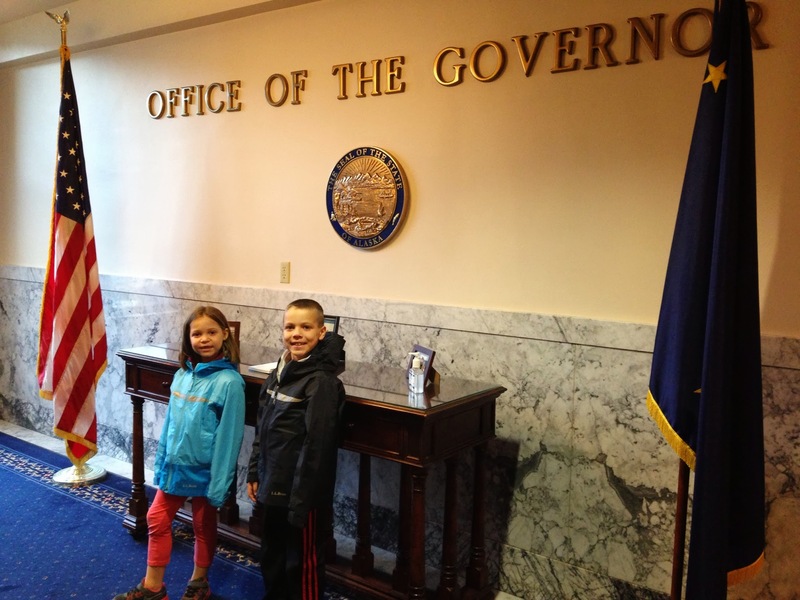 It was actually fun to take the kids on a little self-guided tour, teaching them how the Senate and House work together (or not?) 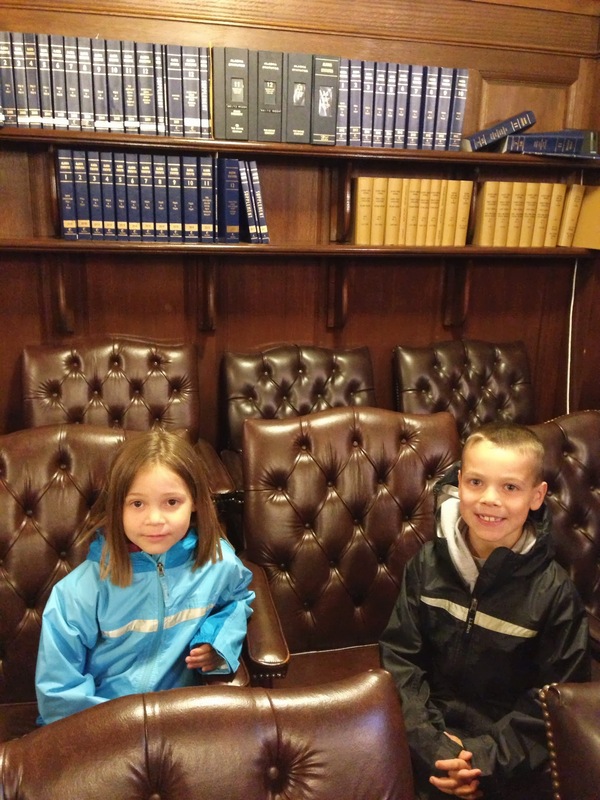 and explaining the basic fundamentals of our government system. 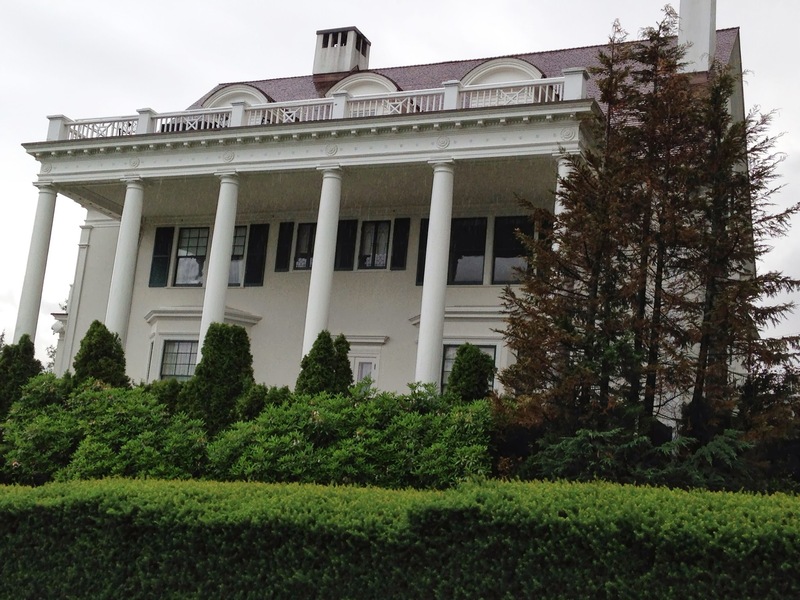 From there we sloshed over to the governor’s mansion. 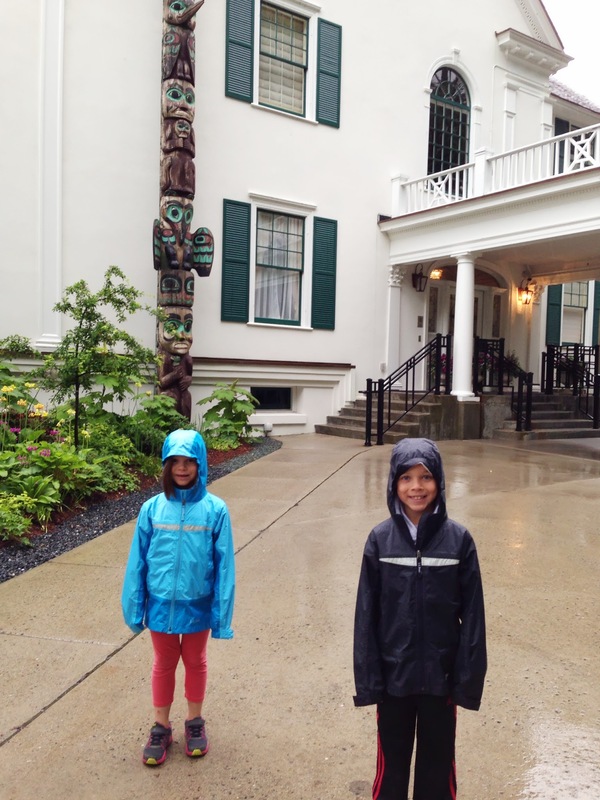 Unlike other states, this is a private residence so we could not go inside at all. Next stop: the docks and downtown. 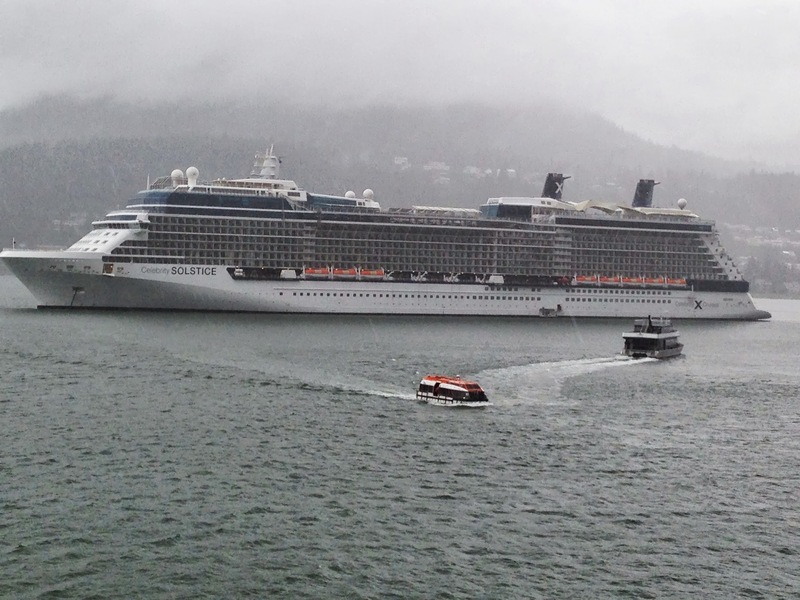 While it was fun to watch four cruise ships sail into town, it was not fun navigating the narrow, rainy streets with all those tourists. The cruise lines gave pastel rain parkas to disembarking passengers, so it felt like thousands of sherbet nuns had been let loose in the city. We could deal with the rain, but the masses of people scurrying about the wet, brick roads was a different matter. 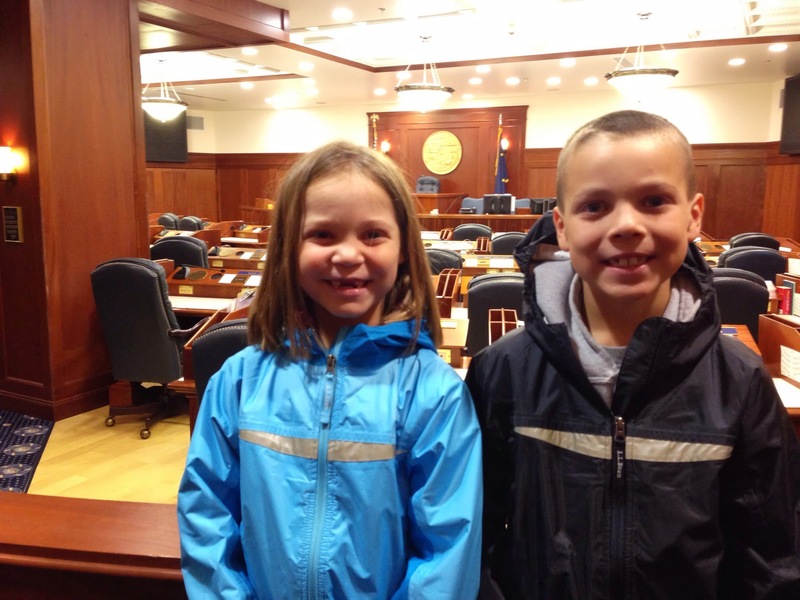 We bailed on downtown and went to lunch! 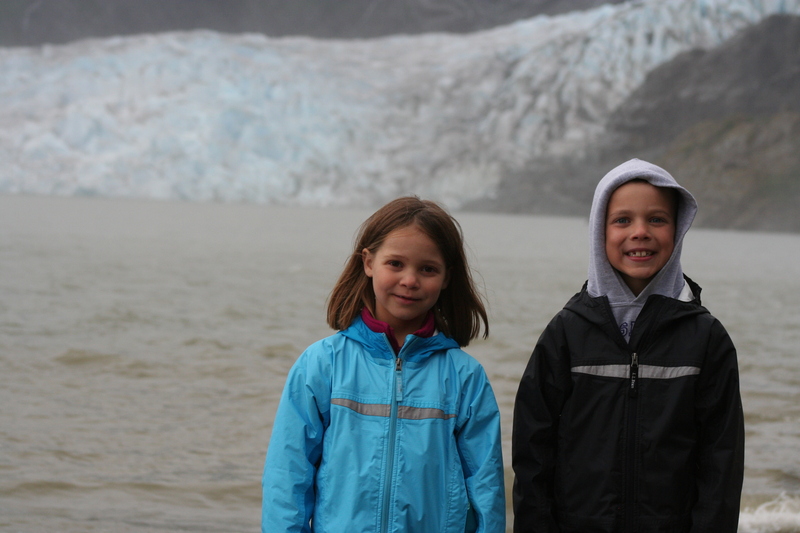 That afternoon we headed out to Mendenhall Glacier. It was difficult to see with the low clouds, but miraculously the rain stopped so we decided to venture down to Nugget Falls. (Maggie took some convincing, but about half a mile in she chippered up.) 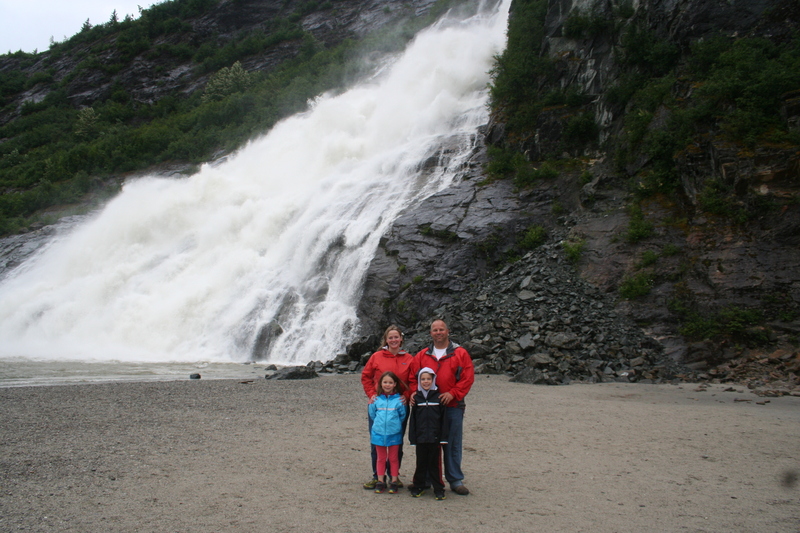 The falls were immense and powerful, and well worth the walk. Unfortunately, the rain returned in full force while we were at the falls. Suddenly we were the ones scurrying… right back to the car! We were drenched when we got there, at least 10 lbs. heavier thanks to our soaking denim and dripping hair. 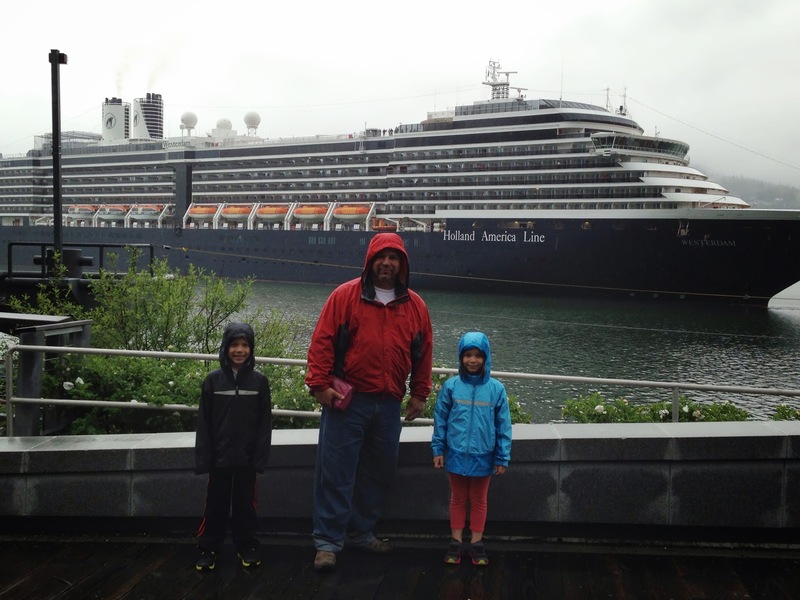 We had gear for this weather back home in Anchorage, but did not pack it for our one little day in Juneau. We had planned to drive further down the road to Eagle Beach before dinner, but instead found ourselves back at the hotel plugging quarters into a clothes dryer! 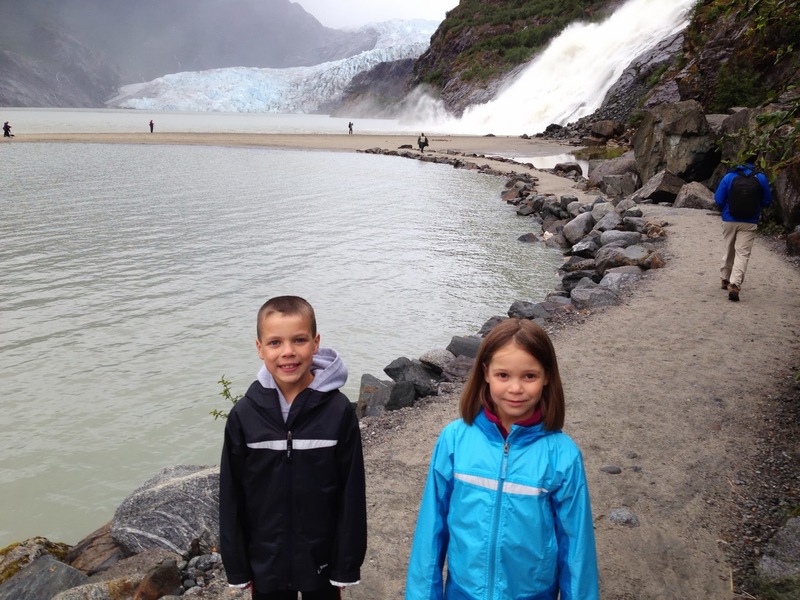 I loved Juneau, and we will definitely be back. There is so much to explore in this isolated little community. 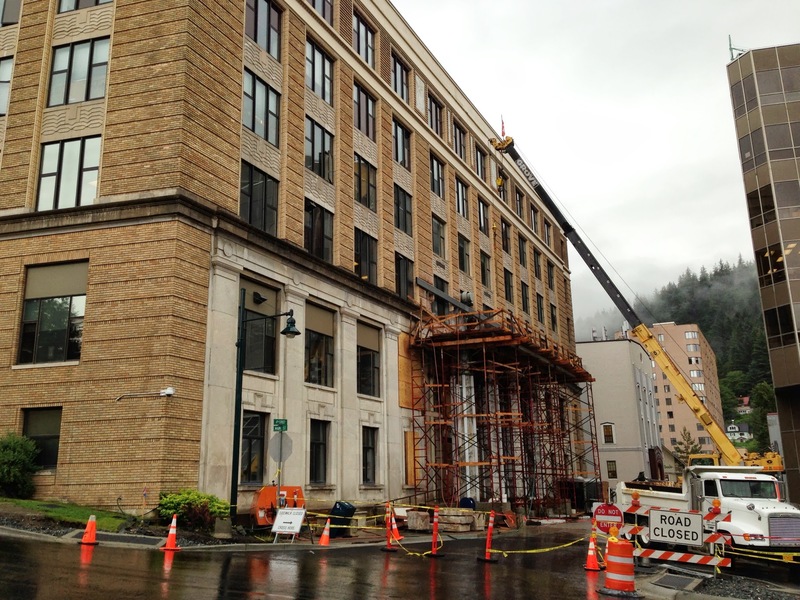 I’ve grown so accustomed to shabby Alaska towns that are surrounded with scruffy black spruce trees, and I’m no longer surprised to see a local library or police station building balancing on stilts above the threat of permafrost. 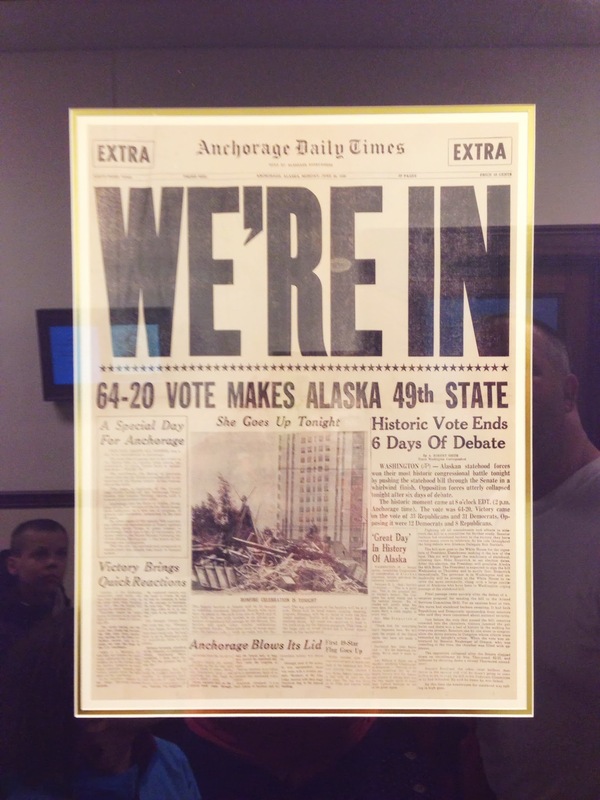 Juneau still felt like Alaska, but somehow different. I’m not sure if it was the old brick buildings, the enormous spruce trees, or the strikingly vertical mountains that flanked the town. One minute the land was flat at sea level, and two steps later it seemed to erupt straight to the sky. Whatever it was, I can’t wait to return and explore it some more!